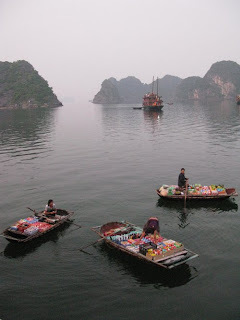 Our last experience in Vietnam was an over night stay on a junk in the magnificent Halong Bay. This area is a UNESCO World Heritage Site which spreads over 580 sq miles with more that 2,000 pinnacle-shaped lime stone and dolomite outcrops scattered across the area. It is an unbelievable site with isolated caves filled with stalagmites and stalactites. Around the area are many floating villages and many of the residents sail the waters selling goods to the people on the junks. Our junk was very colorful and well equipped with bedroom, bathroom, dinning room and area to sunbath and take in the wonderful views. This was a great way to end our stay before travelling the long distance home to Ohio. I have very fond memories of our trip to Vietnam and cherish the friendships of all the wonderful people who crossed my path. You will all be in my heart for a long time to come. I look forward to planning our next trip to teach. 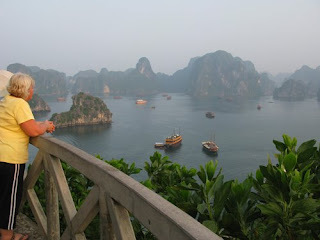 Our last part of our trip was in Hanoi and Halong Bay. Hanoi was a bustling city with so many places to see. As we were there for only a couple of days we decided to take a city tour with a local guide. That way we were able to see some of the highlights of the city. One evening Wendy and I decided to walk around the Old Quarter and came across a fabulous store that specialized in cloth from the minority people in Northern Vietnam. 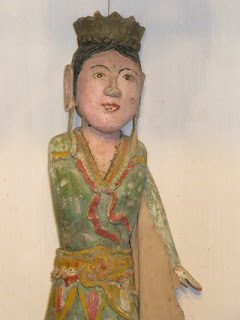 There are dozens of different groups who all do the most amazing hand work. 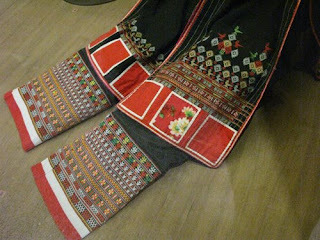 Mainly on their clothing using a lot of embroidery, applique and silver colored beads and buttons. The washed out colors of the old buildings and folk art where very appealing and of course have my creative juices going. 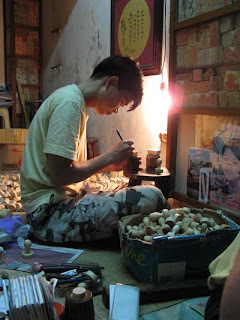 We also came across a young man who carved wooden stamps. We spent about an hour sitting at his store front going through large baskets of amazing carvings. We picked out a few for him to carve our names in as a momentum of this special time. 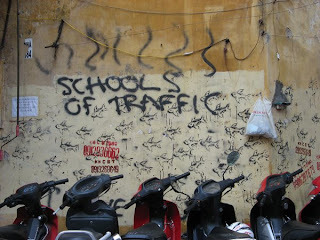 While walking the back streets of many cities we have visited we are always fascinated by the Graffiti. 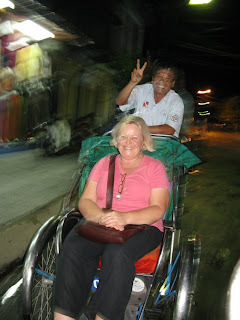 Wendy has taken many photos but I feel this sums up our visit to Vietnam. I will always smile fondly thinking of the millions of motor bikes I encountered on the streets of this friendly country. 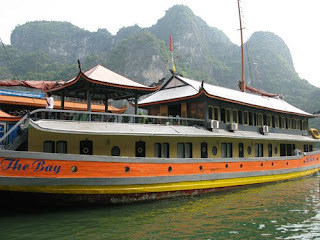 I will post tomorrow about our last stop in Halong Bay. We are very blessed in this country and I have many parts of my life to be really thankful for. I wish you all a wonderful Thanksgiving and special time together with family and friends. We took an early flight to the historic town of Hoi An which is located on the north bank of the Thu Bon River in Central Vietnam. What a wonderful contrast to the bustle of HCMC. It was designated a UNESCO world heritage site in 1999. 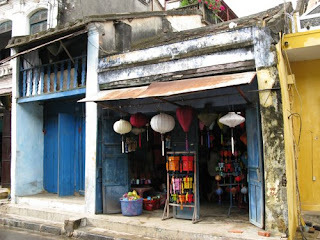 Hoi An is full of long, narrow tube houses, Chinese pagodas and ornate community halls as well as family shrines and a Japanese covered bridge. 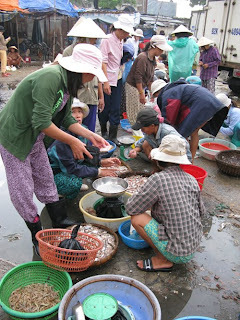 There is also a very interesting market which we walked through many times. It was a feast for the eyes full of great colors and shapes. One morning Wendy and I got up very early to see all the fishing boats pull in and unload all the fish for the day. There are many tailor shops here where you can have any item of clothing made in 24 hours. It was a fun experience to have clothing made in any style and color. 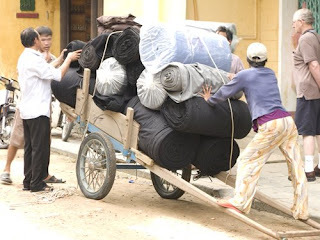 We thought this was a unique way to have your cloth delivered to your store. Just a little different from UPS! 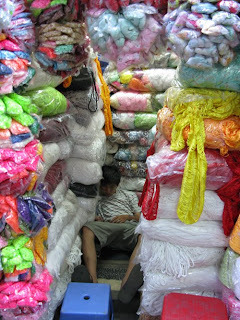 Vietnam manufactures wonderful silk fabrics. We came across a small exhibit of the process of silk making. 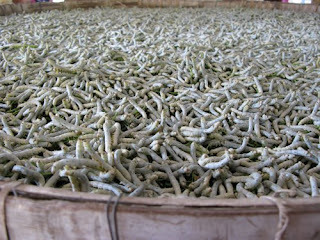 Here are millions of silk worms that will spin cocoons to be unwound for the manufacture of cloth. It is a fascinating process. 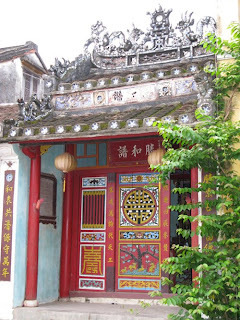 The architecture in Hoi An was wonderful. Wendy and I spent many hours wondering the streets admiring the colors of the buildings and doors. There were many great restaurants and wine bars that were we sat and watched time go by. One night we took a cyclo ride to the Mango Room for dinner. It was an interesting experience. 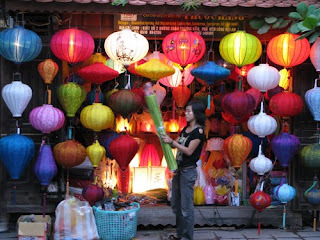 I will always remember Hoi An for the sea of color, filled with lanterns, fabrics, pottery and buildings. 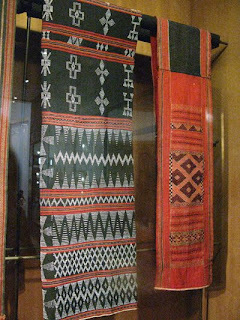 Wouldn’t these make wonderful quilts! My fingers are itching to start a new project. Here in Ohio we are expecting a miserable weekend so I am planning to cuddle up and create all weekend. Hope you all get the opportunity to stitch as well. 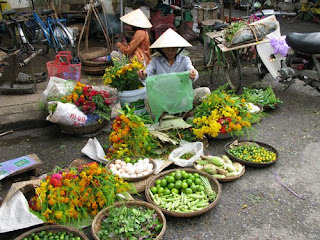 During our stay in Vietnam we visited many markets. 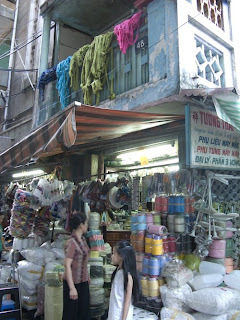 One of the most interesting was the ribbon and button wholesale market in Ho Chi Minh City. 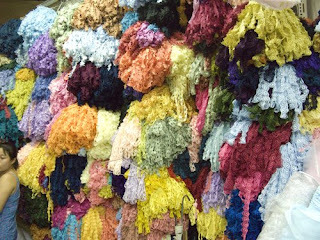 I was fascinated by the array of choices along with all the colors of ribbons and trims that were available. Each store was very tiny with masses of merchandise. As you can see the market was full of color and a wonderful place to dig for treasures. I found some great buttons and ribbons to bring home. 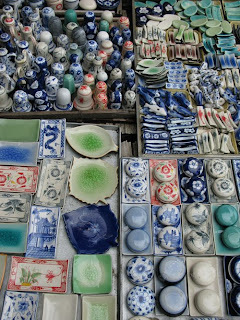 We were nearing the end of our stay in HCMC and visited a travel agent to book flights to Hoi An then on to Hanoi. I have very fond memories of this city with its bustling streets, great markets and all the passionate quilters I met. I will treasure the experience for a long time.